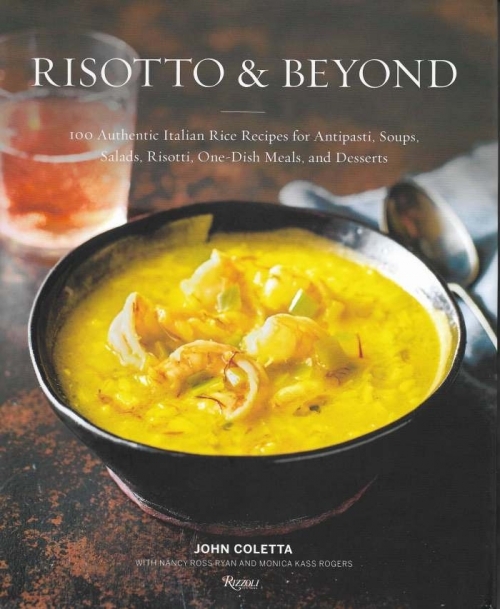 From acclaimed Chicago chef and restaurateur John Coletta comes �Risotto and Beyond: 100 Authentic Italian Rice Recipes for Antipasti, Soups, Salads, Risotti, One-Dish Meals� (Rizzoli; $37.50/hardcover), a recipe collection that explores the rich and varied art of Italian rice cookery. These 100 authentic dishes bring the full range of Italian rice cooking into the home kitchen, from familiar dishes like arancini, crochettes, risotti, and rice puddings to more unusual offerings ,such as rice salads, soups, fritters, bracioli, and gelatos. Italian rice types and cooking methods are explored, providing home cooks with foolproof instructions on how to make perfect rice every time. Basically, Coletta dives deep into rice, offering risotto with vegetables, seafood, and meat in familiar Italian flavors like tomato and mozzarella and more wide-ranging flavors like Speck and Fennel, Seafood and Saffron, Leeks and Grana Padano. To make sure you get a velvety risotto, he gives guidance on rice � look for thick, short-grained varieties like Vialone Nano � a semifino rice � or another superfino rice that has a creamy exterior and cook to an al dente center. With his encouragement, you�ll move beyond Arborio. For the �beyond� recipes � soups, salad, tarts, one-dish meals, antipasti and dessert dishes � he recommends one of the 70 varieties of Italian rice. Together, the book�s recipes expand our notion of Italian food beyond pasta. In fact, Italy is Europe�s largest producer of rice and so not surprisingly, there are easily a book�s worth of recipes and techniques for cooking it�from tempting fried rice balls to impressive, layered timbales, to a strawberry rice gelato. Recipes include Rice Crostini with Ricotta and Oregano; Rice Soup with Shrimp and Leeks; Rice Salad with Bresaola and Parmigiano Reggiano; Risotta alla Carbonara; Braised Turkey Rolls with Chestnut Risotto, Pancetta, and Sage; and Rice Crepes with Nutella. John Coletta is the founding chef and partner of Chicago�s Quartino Ristorante & Wine Bar. It has received three stars from the Chicago Tribune and the Chicago Sun-Times, and won the American Culinary Federation�s 2014 Award of Culinary Excellence. Under Coletta�s leadership, Quartino also earned the Ospitalit� Italiana seal, which recognizes restaurants abroad that promote the traditions of Italian food culture.